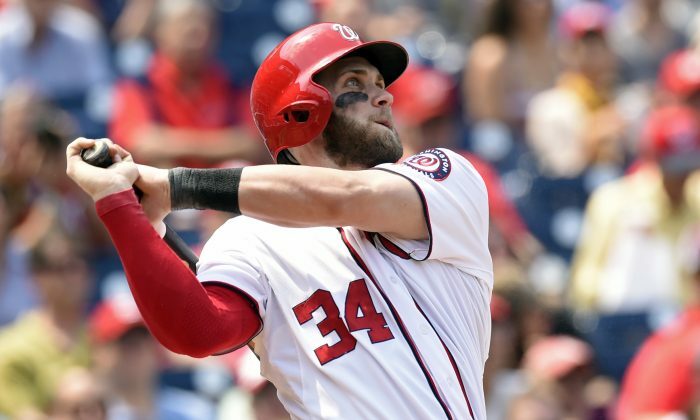 Is This the Beginning for Bryce Harper? He made the cover of Sports Illustrated as a 16-year-old. He was baseball’s No. 1 overall draft pick at 17. By the time he was 19 he had already claimed a starting spot in NL East-winning Washington’s outfield, while anchoring its lineup (with 22 home runs—still a career-high) as well. He was even selected to a pair of All-Star games (2012 and 2013) before he could legally celebrate the honor with a drink. Yet Bryce Harper hasn’t yet lived up to the immense expectations those early achievements have bestowed on him. Maybe this season, where he’s already off to a hot start, will be his launching pad. On Wednesday Harper, still only 22 years old, became the youngest player in the last 45 years to a home run three times in a game in Washington’s 7–5 win over Miami—and the blasts weren’t short either. The 6-foot-3 lefty’s homers averaged 426 feet apiece. They were a glimpse of what he can be. Last year, while fellow young star Mike Trout won MVP, an injury to Harper’s thumb limited the talented youngster to just 100 games, though he was never really the same upon his return. The 13 home runs and 32 RBIs were career-lows and the 38/104 walk-to-strikeout ratio was the worst of his career. Compare that to the already eight home runs (fourth in the NL) and 20 RBIs (fifth) through just 29 games this season. While his power numbers are up, his patience is as well. Harper’s 26 walks are the most in the NL and are a big reason why he’s 10th in on-base-average (.416) despite hitting a mediocre .265. How good is this start? A this rate, he’s on pace for a 45-home run, 112-RBI, 145-walk season that would shatter anything he’s done to this point. If he did pull it all together this year, it certainly wouldn’t be the first time an immensely talented prodigy takes a few years to get into a groove. After hitting between 16 and 27 home runs in each of his first four seasons, former first overall draft pick Ken Griffey Jr. broke out in 1993, as a 23-year-old, with a 45-home run, 109-RBI, Gold Glove-winning season that netted him fifth in the MVP voting. Though Griffey hadn’t exactly been struggling before the breakout season (he was an All-Star every year from 1990 to 2000) that one campaign was the first of seven times in an eight year span that the former Mariners great hit at least 40 home runs in a season—and was well before injuries derailed his career after a forced trade to Cincinnati. Harper still has a long way to go to start on Griffey’s path. Just staying healthy may be his biggest key. The high-risk game that is baseball's free agency period didn't work for Josh Hamilton and the Angels. Does it work for anyone? The Orioles and White Sox played a game in front of no spectators, but that doesn't mean Royals fans haven't seen the same.